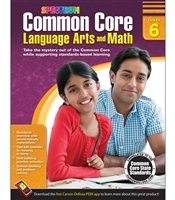 Help sixth grade students master Common Core skills such as using maps and other graphics, understanding pronouns, finding percentages, and more with Common Core Language Arts and Math for Grade 6. 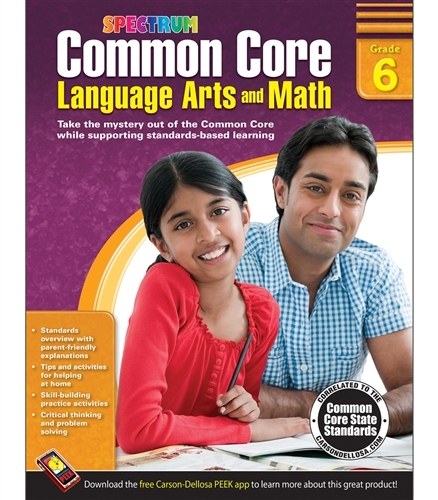 Take the mystery out of the Common Core with these unique and timely Spectrum 128-page books. Schools in most U.S states have adopted Common Core State Standards for English Language Arts and Mathematics, raising the bar for student achievement. These information-packed resources for kindergarten through grade 6 provide an overview of the standards for each grade level along with practice activities for school success. Includes explicit references to the standards on each practice page that will let parents know that activities provide direct support for skills being taught at school.